Fanatic’s Guide to Ear Training and Sight Singing Volume Two is the new addition our best selling singing method Fanatic’s Guide to Ear Training and Sight Singing Volume One. The idea of singing sound based on a “key center” as opposed to singing an “interval” really began a revolution in the way musicians perceive sound. When a seasoned musician sings a melody, they are not thinking the distance between each note they are hearing, they are singing pitches within a “key center.” Seasoned musicians sing this way naturally after years of playing and singing but with Fanatic’s Guide to Ear Training and Sight Singing a student can fast forward their learning so that they can experience 30 years of ear training in a fraction of the time. Fanatic’s Guide to Ear Training and Sight Singing Volume Two adds in some important additions to help a student improve their sense of multiple key centers (17 in total) as well as teach a student how to superimpose basic three and four note chords over these tonalities. Once you learn to hear/sing all 12 pitches over a Major chord tonal center which is the purpose of Fanatic’s Guide to Ear Training and Sight Singing Volume One. Volume Two gives you 17 new key centers to continue to hone your skills at hearing notes in a key center against more complicated key centers. Each of the 17 key centers have exercises in all keys with associated MP3s. Test your ability below to see if “Fanatic’s Guide Volume Two” is appropriate for your current level. Superimposition of exercises based on Chord Tone and Tension Reharmonization. For the advanced student you will find a list for each tonality which recommmends different ways of superimposing the singing exercises over other tonalities. For instance you could superimpose a C Major7 arpeggio over an A Minor tonal center. This is theoretically permissible because the notes of a C Major 7 chord “C, E, G, B” are either chord tones or available tensions in an A Minor chord. i.e. C Major 7 chord in A Minor is: C = b3, E = 5, G =b7, B = 9. Superimpositions for each key center are listed throughout this book. Each key center uses a different instrumental sound! The type of instrument or sonority used to create the key center can also be a factor when students confront various tonalities. This is the reason why many different types of instruments are used for the MP3 key centers that accompany this book. Many different kinds of acoustic pianos, electric keyboards and guitars have been used to help a student become familiar with not only various key centers, but the sounds of various instruments playing those tonalities. An Appendix explaining the theory behind chord tone and tension reharmonization. The Appendix to this book explains how these superimpositions of chords and scales relate and what notes are available tensions. This information is crucial to understanding the how the supplied superimposition lists works with various tonalities. Understanding this information, learning how to hear it and working with it through both composition and improvisation will strengthen your understanding and aural skills with various key centers. what can I say another on target book from Bruce Arnold. I’m just finishing up fatty’s guide to your training and sight singing volume 1 and now look forward to starting volume 2 to expand my key center understanding as well as my knowledge of chordal superimposition.A. Tillsmen. Get Fanatic’s Guide to Ear Training and Sight Singing Volume Two today and transform your sense of key centers!. 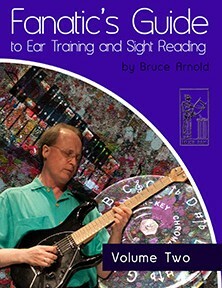 What should I work on after Fanatic’s Guide to Ear Training and Sight Singing Volume Two?